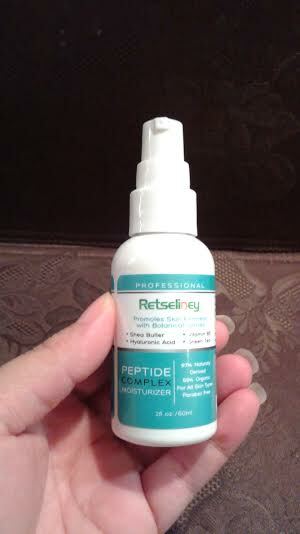 I am loving this Peptide complex moisturizer. I have been using this moisturizer for a while and I love the way it makes my skin feel. My skin absorbs it very well and it does not leave my face feeling greasy like some other moisturizers. This moisturizer promotes skin firmness with botanical actives. I love that it also soothes my face on those days that my skin gets dry. I have used this product with and with serum and I have had no issue with it at all. To me it has a light scent nothing to worry about because as soon as it dries you don’t smell nothing. I have put this twice a day and once a day also and I have to say that when I apply it once a day I don’t have to reapply which is great. It is perfect for dry and sensative skin. It helps with the find lines and uneven skin tones. This product is 97% naturally derived, 69% Organic, Paraben, Sulfate,phalates free and not tested on animals. *I received this product complimentary in exchange for my honest and unbiased review, regardless I only recommend products or service I use personally and believe will be good for my readers.